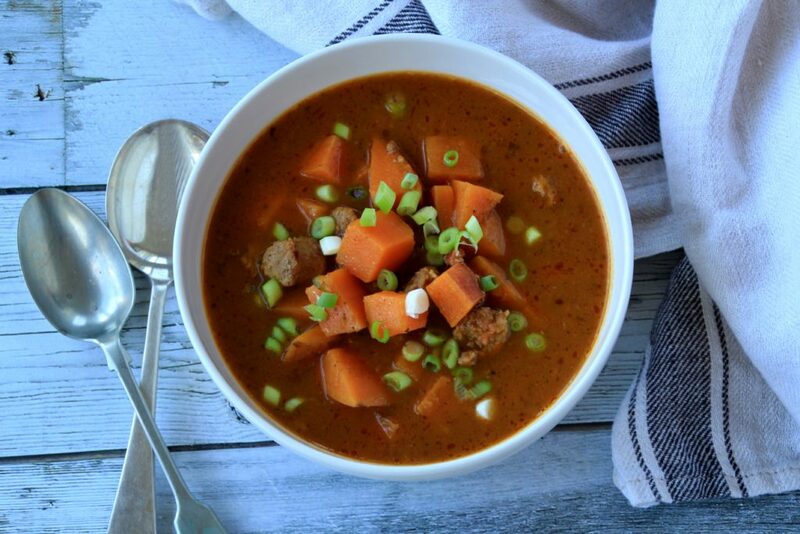 It’s nowhere near cold here in Australia at the moment, but I’m craving soups and stews more than ever. That’s why I came up with the idea to recreate a sausage goulash, which used to be one of my favourite comfort foods. Back home it’s a staple in the short wintry evenings. I would always go for seconds of the steaming flavoursome comfort, complimenting it with a slice of fresh crusty bread. However, the classic version of sausage goulash contains wheat flour, white potatoes and the sausage is usually not of very good quality either. And because those are things that I am mostly omitting in my everyday diet, I made a few twists on the classic and came up with a much more nutrient dense version. Instead of flour this recipe calls for vegetables to thicken the sauce and therefore making it healthier too. I also swapped the white potatoes for sweet potatoes, but for example turnip would work great as well if you are watching your carbs. 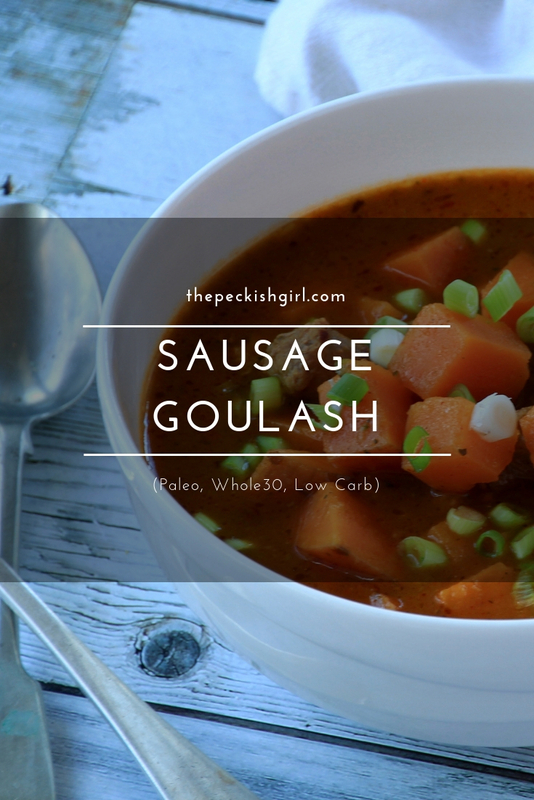 Healthy version of the quick Czech classic, Sausage Goulash (Paleo, Whole30, Low Carb) without flour and secretly loaded with veggies. I made this Sausage Goulash in a pressure cooker, however, don't worry if you don't have one. 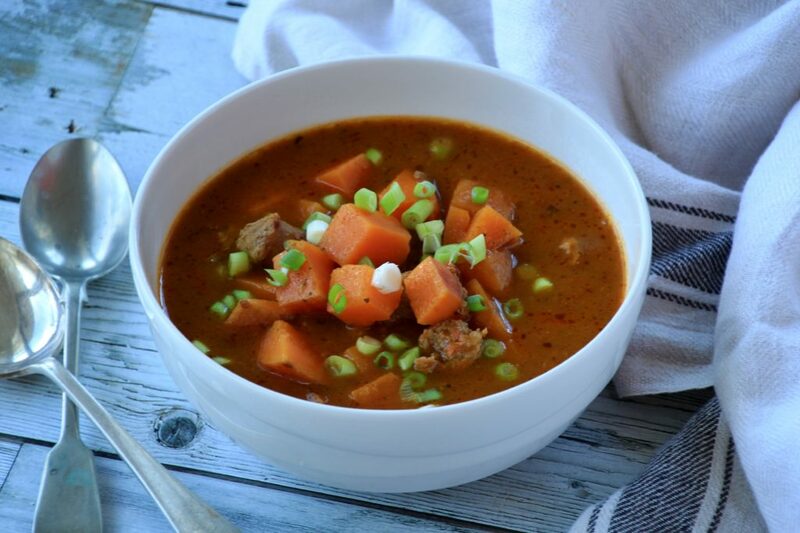 You can easily make the goulash on the stove, just prolong the time slightly. If you are using a pressure cooker, use the setting for browning/searing for this step. Otherwise place a big saucepan over medium heat. Once the cooker/pan is ready, pour 1 tbsp of cooking oil in. When the oil is heated add the diced onion and fry it up until lightly golden colour. Add the shredded zucchini, carrot and crushed garlic and fry together for additional 2 minutes. In the meanwhile place a frying pan over medium heat and pour in the remaining cooking oil. Once heated, place in the sausage cut into bite size bits. Fry the sausage until completely cooked. Stir the sausage in the completed soup. I don't cook the sausage in the soup as I think it takes too much flavour out of the meat, but if you don't feel like frying it separately, you can just add it to the soup at a same time as the potatoes. Serve the soup for example with some fresh green onions on the top and grain free bread on the side.